At the downstream end of our cut on Claim 4 where we were running our testing operations in the 2003 season, we discovered a drop-off in the clay layer. This drop-off runs diagonally upstream across the valley bottom. This means that the upstream half of Claim 4 has relatively shallow ground to the clay layer (approximately 12 ft. average) and the downstream portion of the claim is much deeper after the drop-off. Using our new excavator, we dug down in three stages to approximately 68 feet without touching bedrock. At this depth we were still in gravel (pay-gravels). We tested material from the deep portion of this excavation (using conventional recovery methods) and found the gravels were still running approximately US$10 gold per cubic yard. In a normal placer deposit, gold and other heavy metals work their way down through the gravel and sand to settle and form a rich layer above an impervious layer such as clay or bedrock. It is in this settlement layer that you often discover nuggets and the vast majority of coarse gold. If you have a depression in the bedrock or a drop-off, you will most likely find a super rich gold deposit. Large portions of these claims above the drop off�claims with shallow ground to the clay layer�have been mined at least once before. 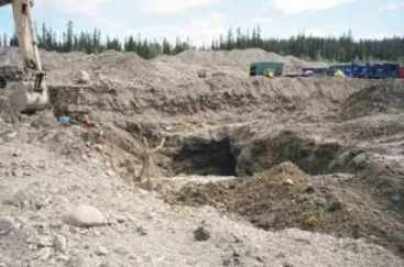 Most of the coarse gold will have been recovered by this mining activity. The remaining gold on these claims is mainly the fine and ultra-fine gold that conventional recovery methods cannot recover efficiently or at all. As we mine below the drop-off we will very likely discover a super rich layer of gold and other base and precious heavy metals as we approach bedrock. This rich layer will be like a "bonanza" or "glory hole" yielding more gold than even the normally rich layer found above the clay layer or bedrock. 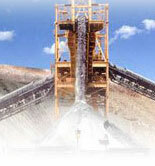 It is also known that none of this part of the deposit has ever been mined�it is "virgin ground". This ground was far too deep and complex for early miners. A search of the records of the past 100 years gives no indication these miners undertook the sophisticated construction that would have been necessary to work at these depths. Additionally, it is important to remember that these early miners could only recover coarse gold. Had they known of the drop-off�there is no indication that they did�it may or may not have been a poor target for them. 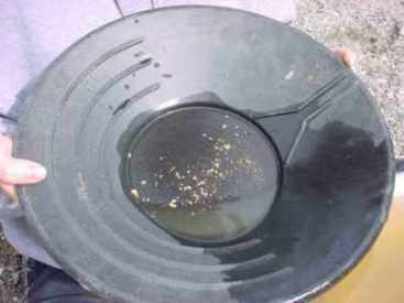 It is a good target for us regardless of nuggets being present because of our fine gold recovery ability and modern equipment. 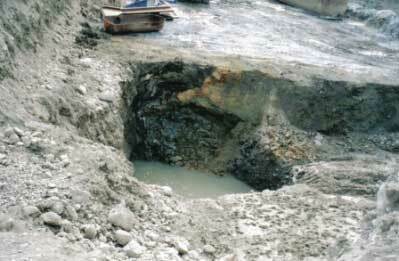 Now that we have discovered this drop-off, we must determine the true depth of the deposit. We must also determine the level of precious values in the clay above the drop-off. It will require additional time and money to carry out this research, but in the long run, it will be worth our effort. The potential rewards of this research will put us in a better overall position with larger proven reserves and greater working assets. As one of our first steps, we will conduct an aerial geophysical survey. The data from this survey will allow us to map bedrock, flow channels, and rich, below surface gold deposit indicators. We will then implement a drilling program to verify bedrock, channels, etc. 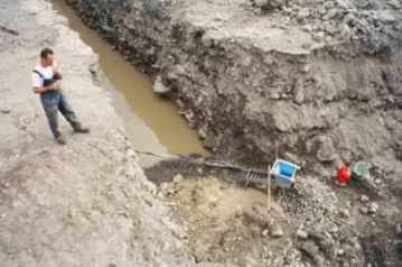 The drill program results will aid the geologist/mining engineer in accurately estimating the total volume of this geological reserve in addition to determining the level of precious values therein. This exploration work will enable us to see what is below surface and help us identify the most effective and efficient ways to mine the deposit.